Office 365 is exceptionally well-suited for small businesses looking to leap into cloud computing, with a full range of productivity and collaboration features. I can almost predict a person’s response to cloud computing based on the size of their company. Those in larger companies distrust cloud computing. Small businesses and entrepreneurs are much more eager to embrace it for the cost savings. That’s one reason why I’m particularly excited about the new cloud-based Microsoft Office 365 platform. There are editions designed for companies both large and small. Office 365 gathers the Microsoft office productivity and collaboration tools within an Internet-accessible interface. 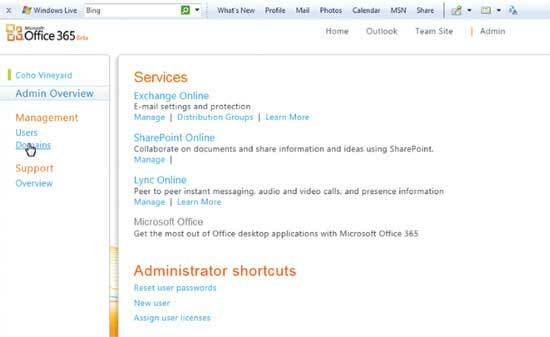 With Office 365, you get Microsoft Office, Exchange, SharePoint and Lync bundled in a strikingly seamless package. When I first saw a demo of Office 365—which is currently in limited beta—I asked to be guided through the features targeted to small business owners (as they’re this column’s primary audience). Considering the raw complexity involved in properly architecting, installing and maintaining these products, Office 365 represents a much-needed lifeline for the Jack-of-all-trades IT professional. What does this lifeline look like? Imagine a team in your office needs to communicate about an upcoming project. There are a few e-mails sent back and forth, and the group decides they need to set up a quick meeting. The presence capabilities built into Office 365 indicate who is and who is not available. 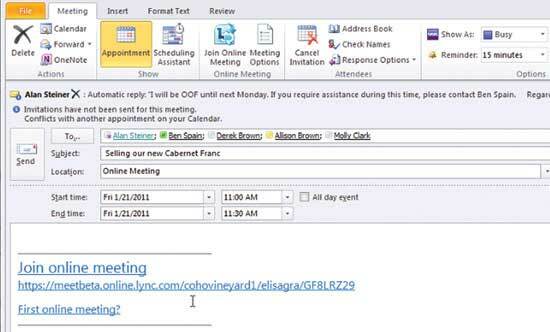 Clicking on names in Outlook lets the team send instant messages to each other and confirm availability. Once everyone is ready, the team can immediately convert the conversation thread into an online meeting (see Figure 1). During the meeting, the team can simultaneously co-edit Office documents from SharePoint while communicating through video chat. They’re not just screen-sharing—each team member is updating the document at the same time (see Figure 2). They’re making changes to the document in real time, with each person watching as the document evolves. It gets better. Small businesses are always working together on collaborative projects and always need to share data. Office 365 lets you grant outside users upload and download rights to a SharePoint site. You can also grant permissions to edit rich client documents. You’ll appreciate this feature if your business has dealt with the pain of transferring data via FTP or through not-always-trustworthy file-sharing Web sites. It’s just as painful—if not more so—for a small business to lose data as it is for a large enterprise. More than one small company has shuttered its doors when “the laptop that contained our important data” went missing. Seeing the pain of fellow entrepreneurs makes me glad for the seamless and automatic backup and restore capabilities of Office 365. The Office 365 data-protection story is multilayered. Deleted data is sent to a SharePoint recycle bin, instead of being completely wiped out. A secondary administrative recycle bin extends the deletion cycle. Outlook users enjoy the same protections with their Deleted Items folder. You can even bring deleted mailboxes back to life up to 30 days after deletion. Search and legal hold features are also part of the package. While not currently available in the private beta, you’ll eventually be able to search across mailboxes when necessary. Using a simple control panel (see Figure 3), the “accidental IT pro” in any small business can easily accomplish basic administration tasks without the usual complexity. Creating users, mailboxes and distribution lists—as well as managing Exchange, SharePoint and Lync—are all exposed in the interface. 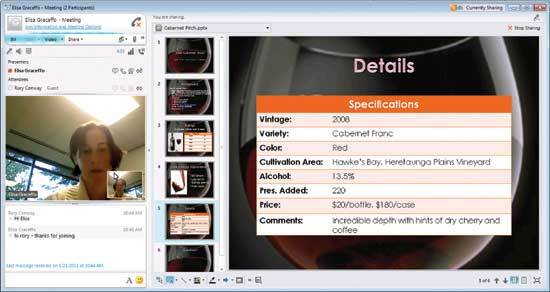 You can even create your own Web site using a WYSIWYG interface linked directly into SharePoint. While the simplicity is nice, it’s what isn’t there that’s fundamentally cool. None of these capabilities are technically new. Exchange has long been a fully featured collaboration platform, SharePoint has always been a document repository, and Lync (formerly Office Communications Server) has been the place where real-time communication occurs. The value proposition here isn’t with the feature set alone—it’s in the fact that all these pieces are already integrated for you. If you’ve ever tried to connect these three massive packages yourself, you know that doing it correctly takes time and experience. Doing it with 99.9 percent guaranteed uptime usually requires expensive outside help. After the demonstration, I decided to start my own Proof of Concept for my company, Concentrated Technology. We’re a small analyst firm with a handful of users spread throughout the country. With little in the way of central IT infrastructure, a service like this seemed perfect for our needs. I signed up for the Office 365 beta. Getting started requires a bit of demographic data as well as creating a company URL. While Web sites in the private beta are limited to sub-domains on Microsoft.com, I’m told there will be domain-transfer capabilities added prior to it being released to manufacturing. Building the initial set of services takes a few minutes. As you wait, Microsoft provides a quick start guide that explains the basics of administering the interface. You can migrate existing data from an Exchange server all at once or in batches of mailboxes. It also supports migrating mail from IMAP servers. However, IMAP migrations will not automatically migrate contacts and calendar entries. You can also migrate SharePoint data, but automating the process requires third-party tools. The next step is installing Microsoft Office, the Microsoft Online Services Connector and Lync 2010 to local desktops. You know what Office does. The connector extends the reach of Microsoft Office from the local desktop to the Office 365 cloud services. Lync completes the installation, adding collaboration features such as instant messaging, audio, video and online meetings. Once everything is ready, ActiveSync for Android, iPhone, BlackBerry and Windows Phone integrates mobile devices into the workspace. While it’s perfect for smaller businesses, bigger companies aren’t left out in the cold. Microsoft is building its Enterprise Edition of Office 365 for organizations larger than 25 people. That will include expanded features that are more in line with the traditional Exchange, SharePoint and Lync experience. Enterprises that already have these pieces integrated and fully functioning with acceptable uptime may see little reason to jump to a cloud service. For the rest of us, using a cloud service like Office 365 quickly bestows small businesses with the collaboration tools enjoyed by the largest enterprises. And, most importantly, while you might not control everything, it works. Are you a Jack-of-all-trades (JOAT) Windows administrator? Are you responsible for networks, servers, printers and everything in-between? If so, you’ve surely developed some useful tips and tricks for keeping those servers running. Interested in sharing? TechNet Magazine’s Geek-of-all-Trades columnist Greg Shields is looking for a few good tips for an upcoming column, and he’s seeking your help. Got a smart tip for managing your Windows servers? Figured out a nifty tactic for keeping desktops running? Care to share a secret trick for managing your IT environment? Shields’ “Top 20 IT Tips” will appear in an upcoming TechNet Magazine issue. He’ll recognize the top 20 smartest IT JOATs in the industry alongside their game-changing tip or trick. Submit yours today! Get your name published, extol your virtues and remind everyone why you’re the ones that get the real work done. Send your tips to gshields@concentratedtech.com. Every submitted tip will get a response.